Two men cut wood all day long. One worked straight through without stopping to rest. At the end of the day, he had a sizeable pile of logs. The other would chop for 50 minutes and then take a ten-minute break. At the end of the day, he had a much larger pile. "How could you chop more? ", asked the man who'd worked continuously. 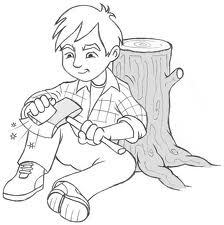 His friend replied, "When I stopped for rest, I also sharpened my ax." - Thomas B. Welch Jr.